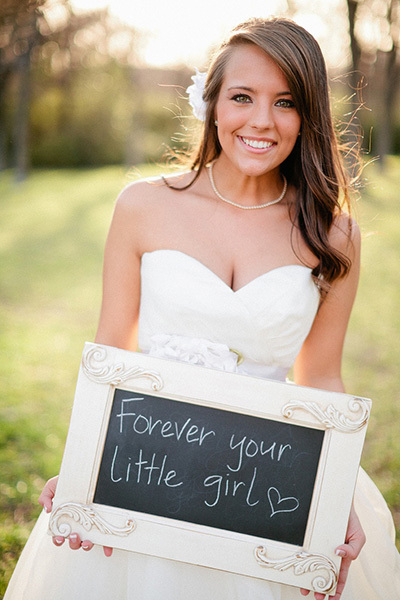 A dad giving away his daughter is undoubtedly one of the most memorable wedding-day moments. Since Father’s Day is right around the corner, we have put together a list of special things to do with your dad on your wedding day! Dress Reveal- Plan on not showing your dad your dress until you are in it. This will make for great pictures as well as a few tears! These are pictures you will cherish forever. Work with your photographer to get the perfect angle and shot. Choreograph your Dance with Special Moves-A little dancing never hurt anybody! Choreograph a special father daughter dance that leaves the crowd wanting more! Either hire a professional or plan something yourself. There are local dance studios that can help you! Check this one out! Father Giveaway Speech- Grab the tissues! Traditionally, a father would toast the couple because he'd paid for the occasion. Even though this is less of a tradition, this is still nice to include in your special day. It shows that you truly appreciate the role that he has played in your life and will continue to play in your new married life. Custom Boutonniere- Work with your florist to create a perfect boutonniere for your father that he can wear proudly down the aisle. Maybe include a token or something that you have given to him in the past. Photo Op- Parents love photos of their kids. Take this opportunity to take a photo your dad would want to show his friends at work or have on display in his office. Work with your photographer to grab the pictures you want to take without him knowing, so it will be a surprise gift!